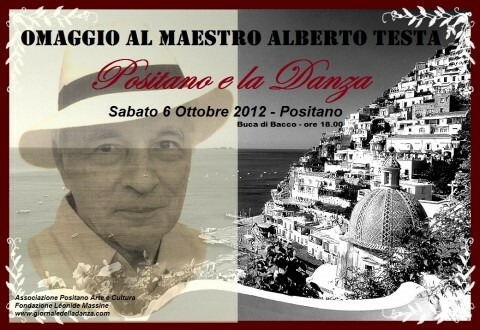 Promoted by Associazione Positano Arte e Cultura (president: Gugliemo Iovane), Fondazione Léonide Massine, (president: Lorena Coppola) and by Giornaledelladanza.com (editor: Sara Zuccari), the event “Omaggio al Maestro Alberto Testa – Positano e la Danza” will take place on October 6th at Hotel Buca di Bacco in Positano. The evening will be hosted by Sara Zuccari who will publicly interview Maestro Testa, going over the most striking moments in his life and career, first as a dancer, then as a choreographer, critic and historian. International étoile Giuseppe Picone will be co-host. The evening will feature dance, with choreographic movements by Lorena Coppola to music by Vivaldi performed by dancers Bruno and Mattia Aversa, accompanied by Giovanna Criscuolo, with costumes created for the occasion by Salvatore D’Orsi and Antonino Terminiello of Atelier Jasha. The program also features the presentation of a booklet, published by Fondazione Massine and dedicated to Alberto Testa by Rosalba De Lucia – formerly in charge of the Positano Tourism Agency – who has for many years supported Maestro Testa in the management of the Positano Léonide Massine Prize for Dance, intitulated to the famous choreographer whose son and continuer Lorca Massine will intervene to give his witness. The Honor Board for these celebrations that see the return of Maestro Testa to Positano gathers numerous personalities of the dance world: Roberto Bolle, international étoile; Gabriella Borni, choreographer and theatre director; Claudia Celi, dance historian; Isabelle Ciaravola, international étoile; Laura Comi, director of the Ballet School of Teatro dell’Opera di Roma; Liliana Cosi, former étoile of Teatro alla Scala di Milano and director of Cosi-Stefanescu dance company; Joseph Fontano, president of WDA Europe and C.I.D-UNESCO; Carla Fracci, international étoile; Paola Jorio, director of Nuova Scuola della Compagnia Balletto di Roma; Irina Kashkova, director of Concorso Internazionale di Danza di Spoleto; Lucia Lacarra, international étoile; Lorca Massine, choreographer; Beppe Menegatti, theatre director; Elettra Morini, international étoile; Alessandra Panzavolta, director of Corpo di Ballo del Teatro San Carlo di Napoli; Giuseppe Picone, international étoile; Luciana Savignano, international étoile; Francesco Ventriglia, director of Maggio Danza; Vladimir Vasiliev, international étoile.